The measure of thermal resistance of air flow through a material. The bigger the number, the better the insulation's effectiveness. Your home has gaps, cracks, and crevices that allow air infiltration, losing you thousands of $dollars a year. Cellulose Insulation is sprayed in and fills in any air penetration areas giving it a good r-value. 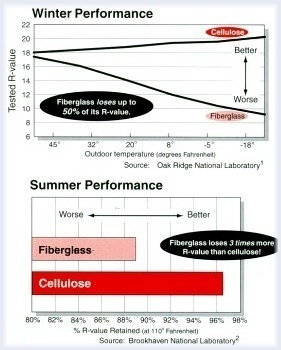 R-value is only one of the comparisions used to determine the better insulation. It should not be used as the only comparision because R-value testing is done in perfect conditions not feasible to real world living.